Are you ready to embark on an eLearning career, but need a little help getting started on the right foot? In this article, I’ll share 8 bits of advice that new eLearning professionals should follow. Let’s face it: going down a new eLearning career path often involves a good dose of stress and anxiety. You don’t know what the future holds. You don’t know what challenges you’ll face on your way to achieving professional success. Fortunately, you have the opportunity to benefit from the words of wisdom of those who’ve been here before. Whether you’re looking to kick off a freelancing career or your own training business, here are 8 rules that, as a new eLearning professional, will help you start off on the right foot. If you want to provide your audience with the most meaningful and memorable eLearning experiences, you need to understand them. You must be aware of their motivations, potential distractions, and emotional factors that come into play. This requires you to explore the psychology that’s involved in the learning process and examine the most basic human traits. Regardless of your online learners’ backgrounds or cultural norms, mental functions and behavioral tendencies are the basis for everything you do. Make a point to learn as much as possible about Instructional Design principles, such as models and theories. If you’re short on time, focus on one new principle every week and dig into its details. For example, the Instructional Design model. Study the pros and cons, as well as its most common use cases and basic principles. Evaluate both sides of the coin by researching the viewpoints of critics and supporters alike. Some new eLearning professionals make the mistake of publishing their portfolio online, only to let it sit untouched for months. They still refer potential clients or employers to the site. But they’re doing themselves a great disservice by not updating the content on a regular basis. Every eLearning project brings with it new skills and experiences, which you should add to your ever-expanding portfolio. Treat it like a constant work in progress and replace outdated or irrelevant samples and work histories with fresh references. 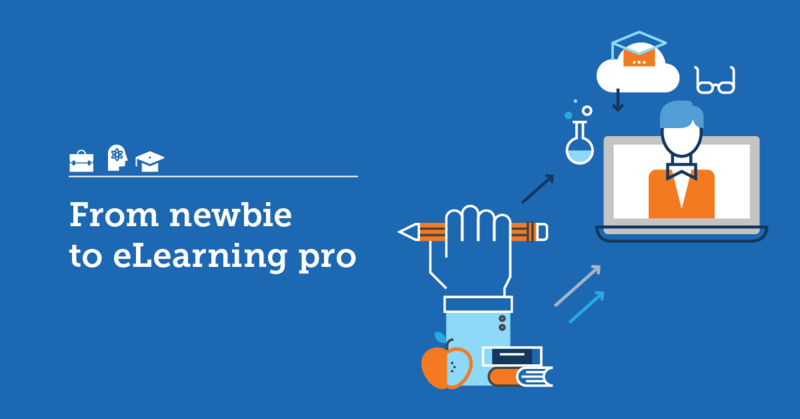 You’ll discover quickly that new eLearning professionals need to be their own biggest promoters. This profession requires a significant amount of marketing. Especially if you take the freelancing or startup route instead of applying for open positions. Don’t overwhelm yourself by trying to check every item on your self-promotion list. Instead, tackle one task every day to chip away at your marketing goals. For example, post on social media or publish on your blog. Attend a networking event or sign up for a marketing course to uncover new tips that can help you build your base. Using learning technologies to develop and deploy effective online training resources is part of the job description. As such, you need to stay current with tools and trends that can benefit your online learners and streamline your work process. Try out some of the top LMS solutions through free trials and demos. Read up on eLearning authoring tools that will allow you to create interactive and immersive online training resources that modern learners expect. Stay ahead of the latest trends that will play a crucial role in the future of the industry. Some new eLearning professionals choose a generalist path. However, it’s often best to find your eLearning career niche so that you can focus on your strengths and pursue your passions. For example, you may prefer to work with organizations to develop online training courses that allow them to realize their business goals. This gives you the opportunity to partner up with numerous clients throughout the year and collaborate with their L&D departments instead of opting for a job that involves a set schedule and less variety. You need to know where you’re heading before you embark on the eLearning journey. To understand what you want to achieve and how you plan on achieving success on your own terms. Better yet, clarify what success means to you, and how you’re going to launch a fulfilling eLearning career. Set goals for yourself, complete with realistic milestones that help you track progress and maintain the career momentum. Be specific regarding what you expect to achieve in the first few months, then expand it to a 5-year plan. It’s true, one of your primary objectives as an eLearning professional is to help others achieve their true potential. You need to fuel their thirst for knowledge and give them the resources they need to accomplish their goals. But you must also continually expand your knowledge and skills. Explore new subject matters and venture outside your comfort zone to rise to the top of your field. Join social media groups to get tips or attend conferences to network with other eLearning professionals and benefit from their expertise. Subscribe to blogs that offer new insights and enable you to continually grow. Lastly, be willing and ready to impart your valuable experiences to others when the time comes in order to give feedback. An eLearning career offers an abundance of rewards, if you’re willing to invest the time and effort. The tricky thing is that the job description is fluid, which calls for flexibility and diverse talents. While some eLearning projects may require a high degree of eLearning project management skills, others require you to take a back seat and be a team player. So, you need to gain as much experience as possible and become a lifelong learner yourself in order to succeed. A career in eLearning is exciting, but beginnings are often difficult and confusing. Learning how to build a successful eLearning career is going to help you find out how to start, how to identify the right eLearning niche, and much more.